I have not searched myself on Google for quite some time, so I was very interested to see what came up as of recent. It was funny to me, because the links that appeared were from my college experience, and not so much high school and below like it used to be. Way back in the day, there were links to community service events that I did, my Bat Mitzvah announcement in the paper, or groups in which I took part in. Firstly, my Facebook link was at the very top of the page. This was really interesting to me, because I’m sure in today’s day and age Facebook is so important in our lives that it would come up first. I also happen to know from past knowledge that Google puts websites that pay the most at the top, which made me wonder if Facebook paid to be first on the search. After that was a link to a high school group I was elected to, and after that was my Twitter account. This really was eye-opening to me, because it further proves how much social networking is a key factor in everything that we do. Google is making it known to whoever is searching me that I am in constant communication with people in my life. The other things that came up was my involvement around campus, and announcements where my name has been included. Also, class blogs and discussions I contributed to in past years. After that, was websites I had never even heard about before. It had my name on “search your friends” websites, indicating that I have accounts made from websites that gather information. On Images, there were pictures of me from years ago, as well as pictures that were not of me, and had nothing to do with me. Pictures from newspaper articles, staff pages for my job, and more were on this page. This was interesting to me because I didn’t know so much about myself was accessible on the Internet. Well, today I searched myself on Google and was happy to find that the first link was my Linkdin Account. If any professionals google search my name, it is relieving to know that they can just click on the first link on Google to see my profile and resume on Linkdin. The second link was twitter and the following links were links to artworks that I have posted on a blog I created during the summer to upload my artwork for a graphic design class I took. Although I was happy to see that my work was being broadcasted, I am not satisfied about some of the art pieces that I did this past summer, so now that I know that the whole world can see them, I will be making that blog private. I also found my personal homepage website to be the 9th link on Google. I am hoping that with an increase in networking with others, my homepage will move up to be the in the top 5 links of mine. I feel that many individuals who are searching for somebody quickly, won’t look further than the first few links of Google if they’re trying to find something quick. As for other links regarding my name, it was interesting to see others that have the same last name as myself. Page 2 had a few random links, such as one to the “Alster Hotel,” located in Hamburg, Germany, and a few links to other people with the last name of Alster from all over Europe. Through the internet, I can find so many people with the same last name from all over the world, which creates this new familiarity and commonality for me with others I’d never knew I find a commonality with! Googling myself–not the real me. I have to say I have definitely googled myself before. I have actually googled my entire family. I’m not quite sure what compelled me to do this, but I did and I happen to find it really interesting. Well, I find it interesting what comes up for the rest of my family–not so much for me. When you google “Michelle Kresch” the first thing that comes up is a “mylife” profile, for someone who is not me. This other Michelle Kresch is 39, and from Austin, Texas. The following thing is another “mylife” profile of another Michelle Kresch who is not me. This Michelle is 43 from Glen Saint Mary, Florida. After these two Michelle Kresch’s on google, the real me starts to pop up. The first thing is my Google+ profile. 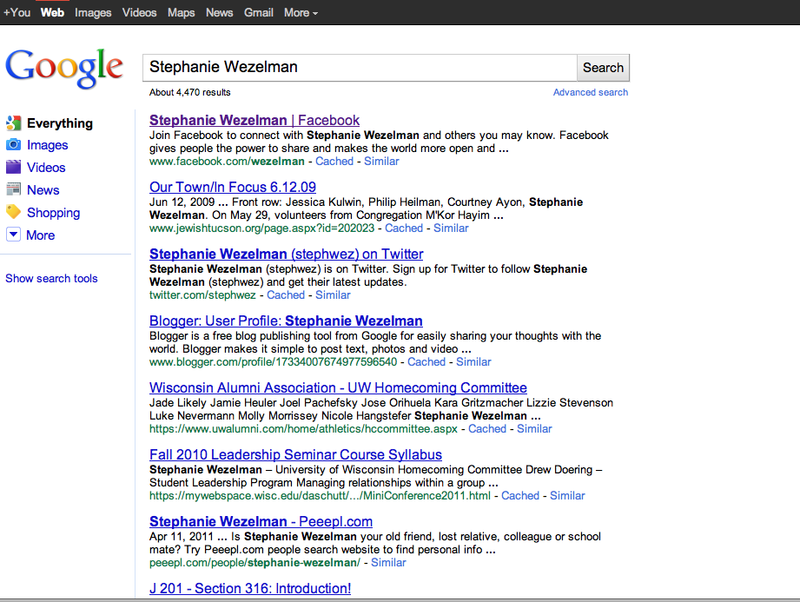 This is unsurprising because I am obviously Googling myself–so Google+ would be high up on the list. The following is an article written about my friend and I starting our own baking business in a local newspaper from my hometown. Then follows my Twitter page, and after that a lot of not-me links pop up again. Maybe these other Michelle Kresch’s “mylife” profiles are higher up on the Google search because google is trying to promote the site. I am fairly satisfied with what comes up on Google about me–nothing to embarrassing is a good thing!